Ric Flair came to the ring in his signature robe and receiving a bouquet of roses from the many attractive women who he had invited to ringside. With pretty much anyone else that would come off as typical unfocused self-indulgent heel behaviour, but when Ric Flair did it the confidence it exuded turned it into a sort of mind game with his opponent. Steamboat didn’t fall for it, and he remained totally focused. The progression of this match was superb. It started with the usual circle of the ring into the collar-and-elbow tie-up, and then from there Steamboat gets the early advantage over Flair, seemingly stopping Flair at every corner. Flair was able to get the advantage with a few dirty shots, and managed to lock in the Figure 4 Leglock, which was broken thanks to the referee spotting Flair using the ropes for leverage, a great moment of clever officiating. From then on it was back and forth, with the sense that the match could end at any point or not at all becoming more and more tangible and intense. Jim Ross and Magnum TA on commentary at ringside gave it that much more atmosphere and made the NWA Title sound important, especially the always brilliant Jim Ross. JR can sell pretty much anyone on any match, and he can sell it that much more better when the substance well and truly speaks for itself in such a grand way as Flair vs. Steamboat. 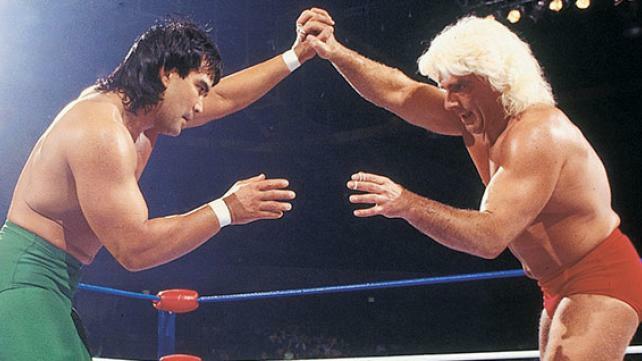 Ross was in to the psychology of this match, he was in to the story of Ricky Steamboat back in NWA after 6 years challenging arguably the greatest NWA World Champion of all time, he knew the facts and figures of Flair’s career and Steamboat’s career and emphasised how it was all culminating there and how much every moment meant. For a match so unpredictable, it only made sense for it not to end on a big clean spot. Steamboat hits the cross-body and takes out both Flair and the referee. He goes for the cover and gets the three-count but there’s no referee there to count it. Flair goes for the roll-up while pulling Steamboat’s tights and also gets a three but the referee stays down. Flair tries to wake up the referee and Steamboat uses the distraction to try and hit Flair with another cross-body, which ultimately fails and leads to Steamboat hitting the canvas. Flair goes for the Figure 4 Leglock as a new referee, Teddy Long, comes out, but Steamboat rolls him into a small package and gets the pin and the title. Each of those moments happen one after the other with a profound intensity and unpredictability. It doesn’t feel clustered, it feels like the absolute most ideal way to end such a match. This is yet another high point for Pro Wrestling as an art form. It’s a very simple art form, but an art form nonetheless, one that can tell a compelling story through choreographed athletic moves and through the charisma and the poise that the athletes bring to them. Steamboat vs. Flair at Chi-Town Rumble 1989 is yet another unmissable match from the /wooo/terion Collection.